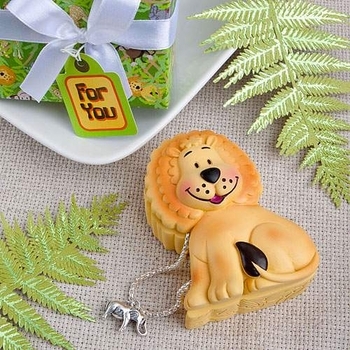 A delightful lion with a friendly face adorns this trinket box and makes a terrific favor for your guests. It's a thoughtful and practical keepsake that the whole party will appreciate. The box measures 3 inches by 2 1/4 inches by 1 1/2 inches tall. Constructed from sturdy poly resin, it is hand painted and includes intricate details like a fluffy mane and curling tail. It's presented in an elegant box decorated with cute baby animals harmonized into a jungle pattern. Comes wrapped and tied with a white satin bow with an attached matching tag that reads "For You". Minimum order is 30 and ships for free. You can also replace the standard "For You" tag with something more personal. Custom Personalized Tags or Stickers can be purchased ($.35 each) for you to design and include your own sticker or tag when giving these to your guests!